When a young nun at a cloistered abbey in Romania takes her own life, Father Burke (Demián Bichir), a priest with a haunted past and Sister Irene (Taissa Farmiga), a novitiate on the threshold of her final vows, are sent by the Vatican to investigate. Together they uncover the order’s unholy secret. 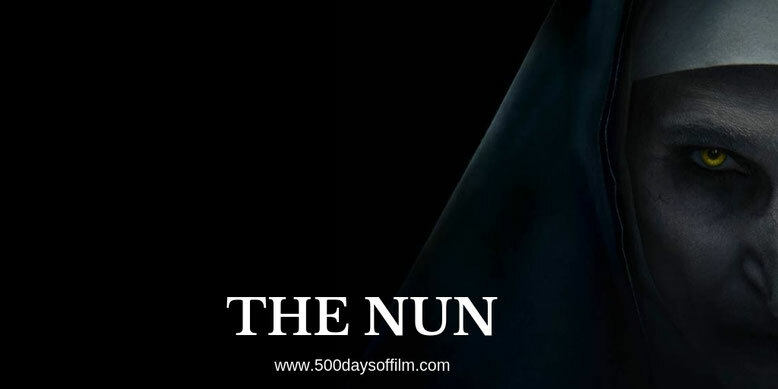 Risking not only their lives but their faith and their very souls, they confront a malevolent force in the form of a demonic nun as the abbey becomes a horrific battleground between the living and the damned. The latest installment in James Wan’s The Conjuring franchise, The Nun is directed by Corin Hardy and features a pretty impressive cast. Demián Bichir, for example, is a brilliant actor - I particularly loved his performance in 2011’s A Better Life. In addition, anyone who has watched The Conjuring 2 will know that the nun in question is really rather gruesome. As a result, the potential was certainly there for The Nun to be a fun horror flick. Sadly, this is not the case. The Nun is an unbelievably boring film with a ludicrous script, irritating characters and - most frustrating of all - no scares. Not a one… indeed, exactly, nun. The film will undoubtedly make money off the back of being a part of The Conjuring franchise (and, oh boy, this link is beaten to death). However, word of mouth will not be as kind. There were no reactions to The Nun in my screening. No jumps, no nervous laughter… nothing. It is easy to see why. Everything is mishandled here. The story is bland (we’ve heard it all before and done better), we do not care about the characters (particularly Jonas Bloquet’s oh so tiresome Frenchie), there is no tension (even in a ‘buried alive’ sequence) and images of the demonic nun emerging from the dark soon feel yawn-inducingly tedious. Meanwhile, it is clear that money was spent in designing and producing the sets in The Nun. However, this is just what they feel like - sets. There is something sterile about the abbey. It is just not creepy in the slightest and wouldn’t feel out of place in a Disney film. As ever, given that many people worked long and hard on this film, it gives me no pleasure to report that The Nun is, well, rubbish. Despite this, I could not recommend it to anyone. Save your pennies. This year has given us some real horror gems - The Nun is not one of them. Have you seen The Nun? If you have, what did you think of this entry into The Conjuring franchise? Let me know in the comments section below or over on Twitter. You can find m @500DaysOfFilm.